World MakerFaire 2012: 3D Printing and Open Hardware - Is this really the Future? Seventeen-year-old GauravJit Singh is a maker of prosthetic arms. And he&apos;s been doing it already for seven years, since he built the first prototype out of straws and yarn, as a sixth grader. Now, a senior at Montgomery High School in New Jersey, and an EMT, GauravJit has created the first EMG controlled hand that allows for individual finger movements using electrical sensors attached to the user&apos;s arm. GauravJit believes in doing-it-yourself when it comes to biotechnology. "I don&apos;t like books." GauravJit explained to me, "Everything I know, I learned from YouTube and internet tutorials. " And this guys knows a lot. The latest version of his prosthetic arm can be controlled wirelessly over the internet, so someone in India can make each individual finger move in America. Like many other "makers" featured at this weekend&apos;s World Maker Faire in New York City, GauravJit uses Arduino, an open-source micro-controller hardware that can be used to build everything from little segway-like servo motor robots, to breathalyzer microphones, to pocket pianos and keytars, to giant LED walls of lights that send you text messages whenever someone moves in a certain way on the dance floor. Make magazine, the creator of MakerFaire, is empowering hundreds of thousands of people across the world to take a hands-on approach to computer technology, and build their own robots, toys, even biotechnological instruments. From its small beginnings in April 2006, where 100 makers demonstrated their creations in hands-on workshops, now there are over 800 craft booths and over 100,000 in attendance. "You don&apos;t own it, unless you can open it" (and program it) -- says the official t shirt. All the geeks wear it, and they&apos;re the coolest guys at this party. "We are all designers now. We might as well get good at it." These are the words of Chris Anderson, editor-in-chief at Wired Magazine, who has recently published a book, Makers: The New Industrial Revolution, about the revolutionary impact that 3D printing will soon deliver to our world. Through this increasingly powerful technology, consumers can now design their own products on CAD programs on their own laptops, and print these designs using ever-more-affordable printers, such as the Makerbot Replicator, and within a few hours, hold in their hands a custom-manufactured project of their own imagination. Anderson claims this will dramatically change the relationship of manufacturers and consumers. Whereas the first Industrial Revolution centralized the process of manufacturing through factories, this third industrial revolution will be heralded by new 3D technologies that would allow us to download "3D designs," modify them, and manufacture them at home. Already, all sorts of things are "printable": from complex mathematical designs in nature-inspired jewellery, to custom furniture that perfectly fits the contours of your rear, to smart textile e-bathing suits that can read your body temperature, to "bio-printing" that allows for the 3D printing of tissues and organs. 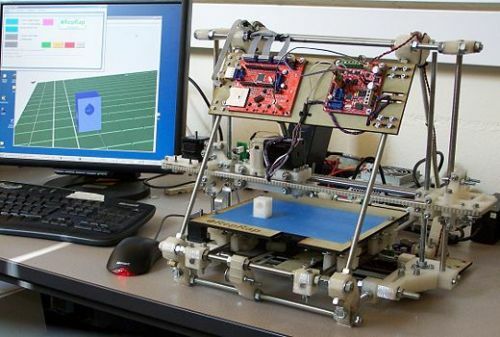 There is now even a 3D printer that can print itself, the RepRap, (which is probably the great-great-grandfather of the Terminator) — that is, this 3D printer can print another 3D printer, possibly an upgraded version of itself. Imagine if the iPhone 4s could do that? "The entire global supply chain has been simplified to a menu item on your computer called &apos;make it,&apos;" exclaimed Anderson. "All of us are makers," affirmed Dougherty, and he quoted Walter Gropius, the founder of Bauhaus, "[We share] a common citizenship of all creative work." While depicting a future where all economic structures of the world will be democratized by new tools of creation and distribution, Anderson now focuses all his energies outside of the editing room on teaching his children how to be Makers. His daughters create their own doll-house furniture on their home 3D printer. He tells every parent: "the future belongs to engineers and designers - teach your children how to make stuff." New York&apos;s Type A parents are already paying close attention to this courtesy call from the future. Up and down the tents of the New York Hall of Science, where the World MakerFaire has been held for the past three years, kids are everywhere, tinkering with materials as simple as play-dough and as complex as Arduino-powered electronic sensors, prepared by laser-cutters, and fabricated on 3D printers. The education of children in robotics, digital design, and computer technology is a priority for this generation of young New Yorker parents. From after school programs, to summer camps, to a plethora of video games and online learning modules, the Maker culture is already putting a strong focus on preparing the young grasshoppers how to grow up with Do-It-Yourself chops. What is missing now is the incorporation of digital design into schools and traditional classrooms. While many science and art teachers are eager to embrace this new technology, there is resistance to making it an official part of school curriculum. However, many extra-curricular programs are jumping on board to fill the gap, and every makerspace, fablabs, and hackerspace is quickly creating workshops for kids. If 3D printing is creating a new kind of consumer, the "maker-consumer" as Anderson calls it - then by the looks of this year&apos;s MakerFaire, the biggest mainstream maker-consumer is probably the parent. While 3D printers have advanced a lot over the last few years, becoming both more powerful and more affordable, the kind of objects that 3D printers can make for at-home-Makers are still rather rudimentary. Resin is relatively expensive, with a small hand-sized toy costing an average of about $5 of plastic resin to print. Thus, for most toys, "Made in China" is still considerably cheaper than "Make DIY," and investing in this technology means valuing the process over the product. Parents are the biggest mainstream end-consumer market for 3D printing technologies and learning services, as they fight to push their kids over the curve, in preparation for a competitive future of technological unknowns. Democracy Now, or Much Later? Among the many unknowns about the Third Industrial Revolution, the scariest elephant in the room is probably employment. With youth unemployment on the rise all over the world, how can parents make sure that their children are well-prepared for the future? As robots replace human manual labor, what kind of skills are necessary for survival in the 21st Century? If manufacturing is moved locally, what will happen to people currently employed in manufacturing in concentrated pockets around the world? How will these advancements impact countries like China, Vietnam, and Indonesia? Law will need to adapt to these social changes: if designs and technologies are kept open source, as championed by the current Maker community&apos;s sharing culture, then how will people be compensated for their innovative work? Will there still be a need for capital-intensive research and manufacturing such as the work of large pharmaceutical companies, alongside localised DIY efforts? How will intellectual property laws be changed in response to 3D printing and "downloadable" objects made at home? Will 3D printing truly revolutionize all manufacturing? Or merely exist alongside it as a small portion of future manufacturing? There will always be an advantage in economies of scale. For example, who is going to create the cartridges for 3D printers? Who is going to mine the natural resources to create those cartridges? Who is going to assemble the 3D-printed parts when mixed materials and complex arrangements are involved? Can 3D printing completely eliminate traditional manufacturing? Probably not. So which industries or businesses will profit most from the 3D printing "revolution"? Currently, the most successful companies in this budding sector are educational and media producers, teaching others about 3D printing and setting up community spaces; as well as hardware manufacturers for electronic parts, such as Radio Shack and Parallax; and to a lesser extent, software developers creating new platforms for 3D design. The printed products themselves are not easy to sell. These small DIY objects might make unique gifts on Etsy, but they are not yet competitive in price or quality as compared with traditional manufactured goods. Futurists such as Anderson celebrate the possible environmental benefits of 3D printing, because Makers and Fixers will "buy fewer things,"because they value and preserve what they build themselves, thus leading to less useless consumption, and a culture of democratic anti-materialism. However, at this moment, such anti-materialism is not yet what the movement needs. The kind of hobbyist crafts that are currently being sold on community 3D printing sites like Shapeways feature a lot of items that would not be categorised as bare necessity "anti-materialist" necessities. In fact, almost all the items currently available are decorative toys or jewellery. For such items to be profitable, some sort of "materialism" beyond basic means will be needed. Rather than creating pure "makers," the current generation of "maker-consumers" now constitutes another niche market of consumers, mostly geeks and ambitious parents, investing in rumours of a future that aren&apos;t quite ready yet. However, advances are happening fast. New uses are being dreamt up and proven viable every year. Last year, at NYU&apos;s Interactive Telecommunications Program, a student created a BurritoB0t that makes nutritious burrit0s. The day may come when 3D printers can be readily used at home to create household products at competitive prices and fair quality, such as food, clothing, furniture, and household appliances. That is the day when 3D printing will really go mainstream, and the average person will begin to "print stuff" for practical daily use.